Provided with real information, will car buyers start making more informed decisions? 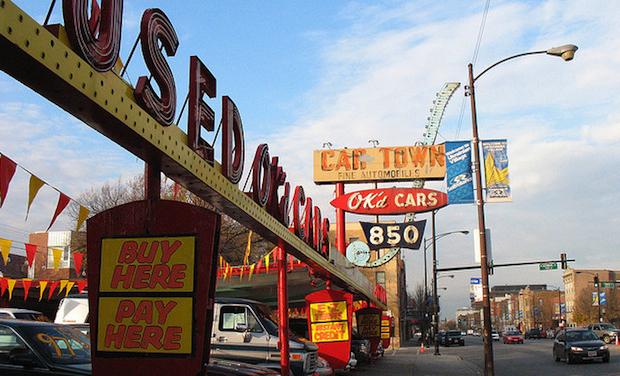 When you’re purchasing a car, it’s easy to see the gas mileage of your potential new rides. They’re plastered right there on the window; a helpful tip from the EPA. But does a car getting 25 miles per gallon really mean anything, except that it’s more fuel efficient than a 20 mpg car? That sticker doesn’t tell you much about how mileage is going to affect your life. 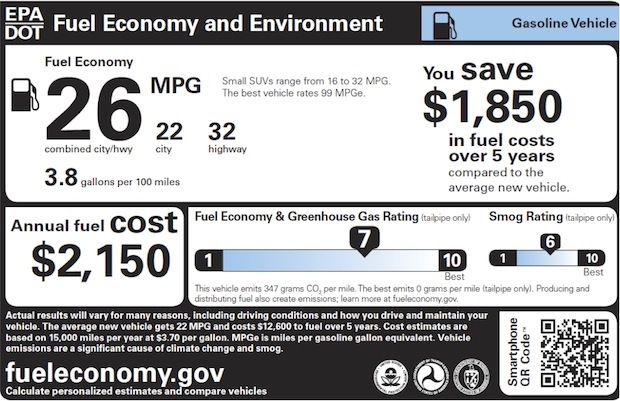 That’s why the EPA redesigned the stickers–they were released today–to help people better understand what they’re getting when they buy a 12-mpg gas guzzler, and perhaps nudge people in the right direction. As you can see, as compared to the old sticker (left) the new sticker offers a wealth of information. Perhaps most importantly–but sadly still buried–is the inclusion of gallons per mile, a much better and more common-sense way of measuring fuel economy that scientists have been pushing to have included for years. 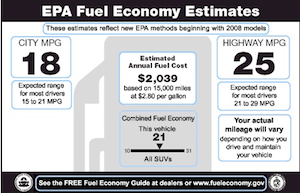 Miles per gallon isn’t actually a linear scale: Increasing your fuel economy from 10 to 20 mpg saves much more gas than increasing it from 20 to 30, making it a fairly useless measure of improvement without a calculator handy. But gallons per mile is more sensible and is comparable across the board. You now know how much gas you’ll use in a 100 mile trip. The addition of how much cash you’ll save on gas as compared to the average car should also cause some major behavioral changes in the car lot. For some gas guzzlers, that number is going to be negative. Are people really going to purchase cars that they know use more gas than average? The new labels also include options for all sorts of alternative-fuel vehicles. 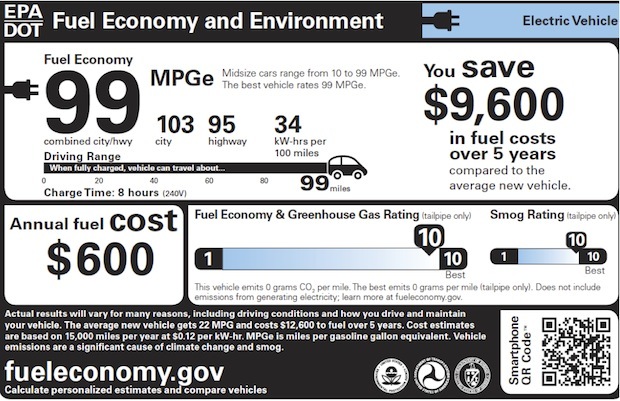 The electric-car sticker shows kilowatt hours per mile, charging time, and how long you can go on one charge. And these cars rate highest on the greenhouse-gas rating scale. Concern over greenhouse gas seems as though it’s not a primary driver of car decisions, but those nearly $10,000 of savings should be. The EPA, now fully embracing the future, even employs QR codes on all stickers, so you can get the information right on your phone. The stickers will be required on all cars model 2013 or later. Will they change car-buying trends? Remains to be seen, but if people are paying attention and like saving money, they should.